Rare antique Baccarat flat bouquet faceted paperweight. 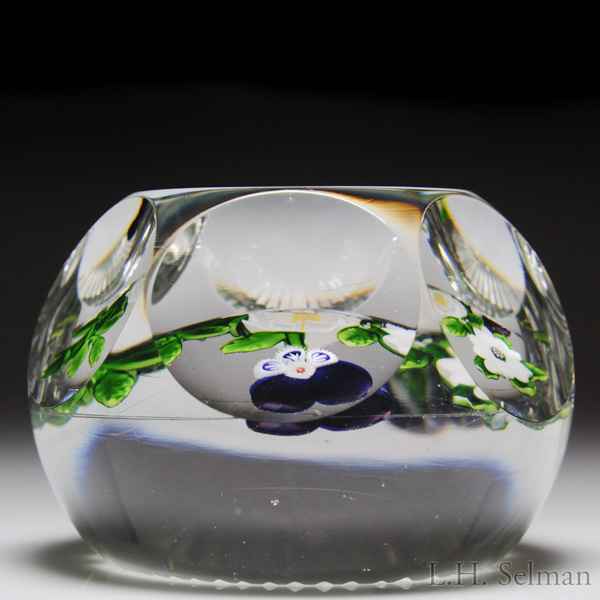 Rare antique Baccarat flat bouquet faceted paperweight, with a dazzling and rare floral group. A large central white buttercup forms the center, with a bundle of yellow star rods making up the stamen. It is flanked by two Type-I pansies, with shaded purple upper petals and a trio of cobalt blue and white arrowhead cane lower petals. The bouquet is crowned by a white double clematis, with a star cane center. A light green vine bearing a blue bud and green leaves entwines the central dark green stem. Six and one faceting. Star cut base. A broken stem below the clematis. "In contrast to the work of the other French factories, Baccarat produced conspicuously formal floral arrangements. These masterfully portrayed flowers combine to form a delightful garden. The millefiori cane sections that compose the bottom of the pansies indicate that this weight was produced in the early part of the classic period." --The Art of the Paperweight: Challenging Tradition. Diameter 3 1/8".